Nothing makes a Hearthstone player giddier than the imminent launch of the next expansion. 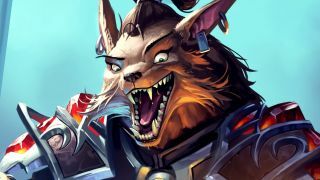 Shiny new cards unlock myriad deck-building possibilities, old favorites have access to powerful new tools, and whatever's currently dominating the meta usually gets taken down a notch with fresh tech cards. The Boomsday Project set debuts on August 7, bringing a multitude of mechs, a new Hero card for Warrior, and the game's first-ever Legendary spells. And while there are plenty of amazing cards that have obvious uses in existing decks (including some infamously strong stuff for Druid), there are also some outliers that appear to be experimental, straight-up bad, or some combination of the two. But the spiciest memes are born from the most unassuming cards. While the competitive meta will always be defined by the most finely tuned, brutally efficient decks, there's a certain kind of magic that comes with winning through unconventional means. Sometimes, those 'joke' cards can even ascend to viability at the highest level of play, like when King Togwaggle became the centerpiece of a powerful Druid Mill deck. After excitedly watching all the card reveals over the past few weeks and gleefully anticipating what the new meta might bring, I've picked five of the meme-iest cards that will surely grace many a Hearthstone highlight video. As the wise Ben Brode once told me, "it's more fun when you beat people with bad cards." It doesn't get much more deliciously flavorful than this. As its name would suggest, Star Aligner requires tons of planning and plenty of luck to activate this handsome astrologist's absurdly powerful Battlecry. But you'll feel like you just hit the jackpot at the Vegas slots if you manage to cast this 7/7 minion that does 7 damage to all your enemies like a Death and Decay on steroids. If that doesn't completely clear the opponent's board and set you up for assured victory, you probably weren't going to win anyway. The fact that it's a neutral minion means multiple classes can try their luck at getting this guy to work; I reckon Shaman might have the best shot with Grumble, Worldshaker combined with Voodoo Hexxer. But hey - maybe all you need is a pair of Oasis Snapjaw turtles to make your opponent see stars! I've always been a sucker for alternative win conditions in card games. Magic: The Gathering's got a ton of them, including a personal favorite of mine (which, humble brag, I've managed to pull off a few times): Barren Glory. This odd enchantment can instantly win you the game from what otherwise be a hopeless situation, where you've got nothing else on your board or in your hand. C'thun's mechanized incarnation takes after Barren Glory and Uther of the Ebon Blade, offering a way to instantly destroy your opponent for a win condition that completely ignores health totals. And Mecha'thun makes things even more difficult by requiring an empty deck, and the time to trigger its deathrattle before it's silenced, Hexed, or Sheeped. Like Star Aligner, I love the fact that this is a neutral card, so any class can take a crack at coaxing the robotic Old God into doing their bidding. I'm thinking Warlock might stand the best chance, given the class' ability to cycle through its deck before obliterating everything with a game-winning Cataclysm. You'd never hear of a "game-winning Cataclysm" until now. The sheer excitement shown by senior game designer Peter Whalen in this recent Hearthside Chat video is infectious, especially when it comes to Whizbang the Wonderful. This neutral Legendary minion is effectively 18 decks in one, as he provides you with a randomly chosen deck recipe at the start of each game. If you're a new or budget player who loves a little variety, Whizbang is a must-craft, as his decks will give you access to tons of diverse playstyles and powerful cards that would typically cost a ton to add to your collection. But Whizbang also presents an opportunity that has the Hearthstone community all fired up: a chance for expert players to show their skills by climbing to Legend rank with Whizbang alone. After agonizing over (and finally conquering) the climb to Legend, I can't imagine how tricky it must be when you don't get to choose your deck or the cards that go into it. This helpful Reddit thread outlines the presumed power level of all nine classes' current deck recipes - and from the looks of it, anyone brave and dedicated enough to take on the Whizbang Challenge has quite the legendary struggle ahead of them. By most accounts, Dr. Morrigan is an absolutely terrible card, on par with junk Legendary minions like poor ol' Moorabi or Duskfallen Aviana. Playing a 5/5 for 8 mana that has no immediate impact seems just as effective as simply skipping your turn, getting up from your computer or phone, and waiting for the cold embrace of death. But the cleverest, craftiest players like DisguisedToast and Dane will surely find a way to break this card wide open. Current theorycrafting suggests an infinite loop of Dr. Morrigans using Spiritsinger Umbra and Baleful Banker into an empty deck. This should theoretically cause Dr. Morrigan to swap in and out of your deck over and over; throw in some Knife Jugglers, and you'd got a guaranteed way to ping your opponent's minions and face to death. We'll have to see wait and see what Dr. Morrigan can really do in practice, but I'm excited to see this freaky scientist shatter everyone's expectations. I'm secretly rooting for Reckless Experimenter to usher in a new dynasty of Deathrattle Priest decks - but until then, the seemingly innocuous Common card Topsy Turvy could very well flip the competitive meta on its head. The ability to flip any minion's health and attack is exactly what Combo Priest decks need to win - and unlike Inner Fire, the zero-cost Topsy Turvy won't get nuked by a pesky Skulking Geist. I find Combo Priest fascinating, due to how skill-testing it is for both the player and their opponent. A one-turn-kill can spring out of nowhere - sometimes as early as turn five, following the rollout of a beefy Twilight Drake - so both players need to know when to play defensively and when to go all-in on a game-ending play. There's also a ludicrous OTK setup floating around that uses Test Subject and Vivid Nightmare - and if Topsy Turvy can make a combo like that possible, surely it's worth of spicy meme status. Will this archetype be a repeat of the failed Freeze Shaman, or somehow defy all logic to become viable? Cards like Astromancer and Meteorologist reward Mage players for keeping huge hand sizes - but unlock Hand Warlock and Hand Druid, Mage doesn't typically want to simply pass the turn without playing a card. Perhaps the Hand Mage cards will find a place in control decks like Big Spell Mage (my most beloved deck). But for now, they seem hilariously wonky - which, in a game as varied and unpredictable as Hearthstone, is actually pretty great. For more info on what's in store, read our interview with the Hearthstone designers about The Boomsday Project!